�����Dealers are heading for New Orleans this week for the ANA Spring National Money Show. Most will be continuing their search for anything that resembles premium quality, whether it has extra eye appeal, superb color, or preferably the CAC or + designation. There will be an excellent opportunity to bid on a tremendous number of rarities out of the Stack�s Bowers Galleries ANA Auction. The 1879 $4 Gold Stella Coiled Hair in PCGS PR64 Cameo will certainly be one of the many highlights. 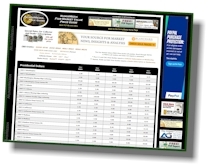 �����There is a massive amount of adjustments throughout the charts in this week�s HD Wholesale Market Dealer Price Guide. 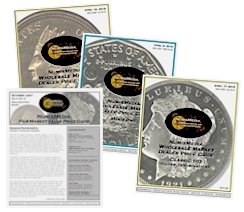 From Early Half Dollars through Gold, the majority of the changes are advances as dealers are selling at higher levels, and most of the sales are for better dated coins. The 1802 Half Dollar jumped to $21,500 Market in AU55 and $35,500 in AU58; the 1817/3 in MS64 moved to $19,350. 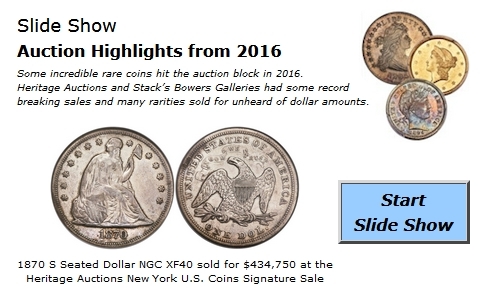 �����The 1849 Seated Half Dollar in MS64 CAC is up to $6000 this week. Below are a few more examples of the many dates that have advanced recently for CAC labeled coins. Check our Online CAC Price Guide for more updates. �����The Gold charts are showing a lot of green (increases) with generics leading the way. In addition, Type I Twenties are extremely active and original coins are definitely the most desirable. We have updated many prices from AU50 to MS61, and some of the increases were significant. The most notable may be the 1854 S in grades Fine through MS60. The MS60 is now at $12,650 Market.